I went inside the Immigration area after paying the Php 550 Philippine Terminal Tax. Since I didn't get to write on a Disembarkation Form yet, I went straight to the counter where the loose copies were. And right after filling up a form, I lined up. There weren't many people in the airport then since it was already late in the evening. So when I waited for my turn at the Immigration booth of NAIA 3, I was already the next one in line. I've never really chanced upon the kind of questioning that I experienced from this certain Filipino Immigration officer, that night of November 17, 2012. I actually forgot his surname. But I was sure that it started with an 'R', so it was either Ramos or Ramirez. He was probably at his 50's. Very serious looking. So I thought he would be like those previous officers that I've encountered who would just look at you, devoid of any emotion from their faces. But he was different. I felt he sensed that I was a female, solo-traveler. Anyway, here's what followed. The immigration officer looked at me and suddenly went full blast on his Q&A portion. Weird as it was, I just felt like I was being profiled or something in that manner. 1) He asked for my passport (my new one that had no stamps yet). And then he asked for my old one. Good thing I brought it with me. 2) He asked where I was going. I answered, Vietnam. 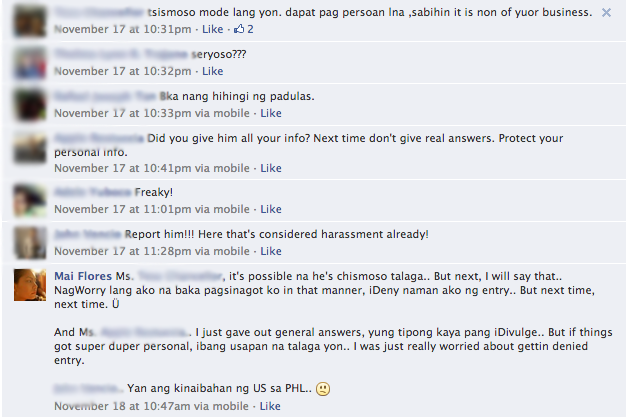 3) He asked who I was meeting there, and if that person was a Filipino (IT JUST GOT PERSONAL FROM HERE). I said that I was meeting my boyfriend, who happened to fly to Saigon earlier than me. I was already put off by those questions alone. I wanted to cooperate since I didn't want to experience any hassles that night. It was my vacation, damn it! 4) AND THEN HE ASKED MY BOYFRIEND'S NAME and how many years have we been dating! Imagine that. --- Okay, so I told him Rubel's name, and the years that we've been together. That's when he said "siguro naman kilalang-kilala mo na yan." (I'm sure you probably know him well by now). 6) He then asked where the photo was taken. I answered, Guimaras. Then he suddenly commented that I had a nice-looking phone. So I just said, thanks --- with a plastic smile. 7) He made a side comment that I probably traveled a lot, which I agreed with him on. And then he asked where I worked. That's when I told him that I co-owned a business. 8) The man wasn't satisfied so he asked that I show him my company ID. WOW! Okay, so I had to rummage through my bag, and then through my wallet just to take out my ID. Since I work under BRASS KNUCKLES INC., he asked what the company was about and how many years have I been working there. I told him since 2007. He then asked my designation. So I just pointed out the description on my ID. My goodness... I thought the interrogation wouldn't stop! That Q&A went on for several minutes before he gave me that much awaited stamp on my passport. It was insane! It got me all the more cuckoo since I was already hungry at that time. He handed me my passport without any expression on his face, as if we never conversed. So when I finally got myself a seat in my favorite restaurant in NAIA 3, I posted what happened to me on Facebook. So many people left comments minutes later. It was so overwhelming. Now I know what to do the next time that happens. But of course, I hope it never occurs again. How about you? Have you had any immigration horror stories? naku kumulo dugo ko sa immigration officer na yan ha, sis. mukhang may attitude problem. buti nalang nalampasan mo. I got asked a lot of questions once, when it was my first time to go out of the country. After that, it was a breeze. When I flew to Belgium, the officer only asked me two questions (how long and what will I do there) which really surprised me. I was expecting a lot of hassle. I heard enough of que horror IO stories sa NAIA and Clark. Still you're lucky enough to get the stamp Mai. Charge to experience na lang. Looks like he's really interested in your personal life. And I admire you for keeping your cool. Thanks Mach! I just felt like I had to comply. But if he delved in deeper into my personal life, then that would be a different story. Have you had any bad IO encounters before? Wow, this is just weird, super personal na ang mga questions nya. What is the name of my sister? Where in Malaysia am I going? And many more I can't remember. It didn't end there. They led me to a cubicle and found out I was meeting their sort of manager/head and she was going to talk to me. And when she came, she asked me the same questions all over again. Lastly she asked for my ID. That time, I was working for a TV Station and presented my ID there since I was used to doing that anywhere. That's when she said "oh taga ____ ka po pala" And then she started to apologize and told me they were just making sure about my traveling and then she became chummy and telling me that it was all about anti human trafficking etc. That took more than 15 mins. 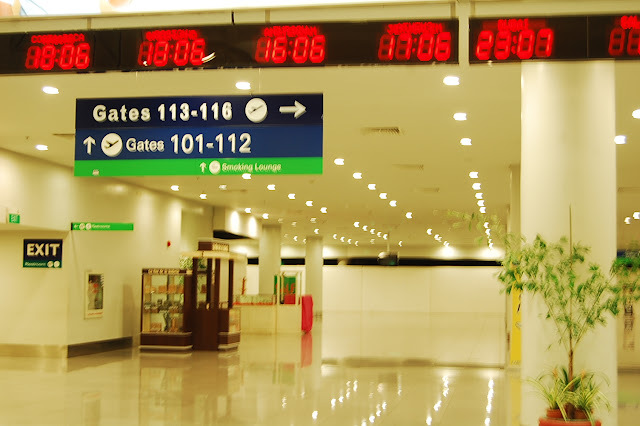 And then when I went to Malaysia and was in the Immigration Officer, they let me pass in less than 5 minutes! /facepalm. And mukhang dito lang sa Pilipinas ganyan. I've been to other asian countries. But I've only experienced this kind of questioning here in our country. We have the worst immigrations in the whole wide world and the most arrogant one as they tend to power trip on their right to stamp. The key is to weed out potential flyers who are escaping the country and you can find that out in just two to three questions. Funny, thing when I'm at the immigrations, I already start removing my watch, my belt, etc so I could then breeze through the final inspection so when the immigration officer sees that I'm already rushing, they tend to rush too. Hi dear! I've experience a lot of that! Mas strict nga sila kysa sa singapore. Kht married nko and hve visa sa SG they still asked tons of questions. Happened the same to my sister as well. The officer told my sister that she's not allowed to go out of the country with no reasons at all so the actions we did since this happens many times already plg nlng gnn, is to call Immigration in philippines and talk straight to the supervisor or manager to ask whats their reason to stop my sister from travelling? And they cannot answer at all. Last time as well they even followed my sister kht nsa boarding gate nah and told her dont go to this country its not safe and they will actually help my sister daw haha. They are just insane thinking that all filipinas are prostitute! No respect at all. For SECURITY REASON...they always say that. But questioning you with personal matters IBA NA ATA YUN. oh! that was some kind of horrible experience. 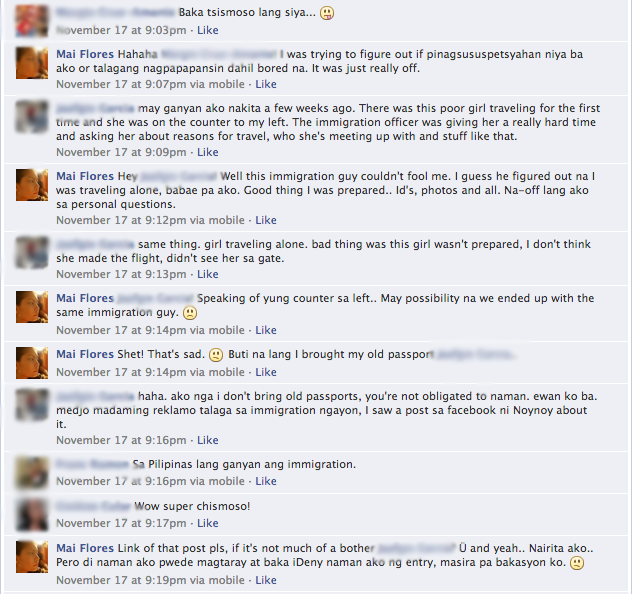 Maybe good for me as I've never encountered an immigration officer like him before. If its for reason of safety or protection, maybe not so personal questions are necessary. 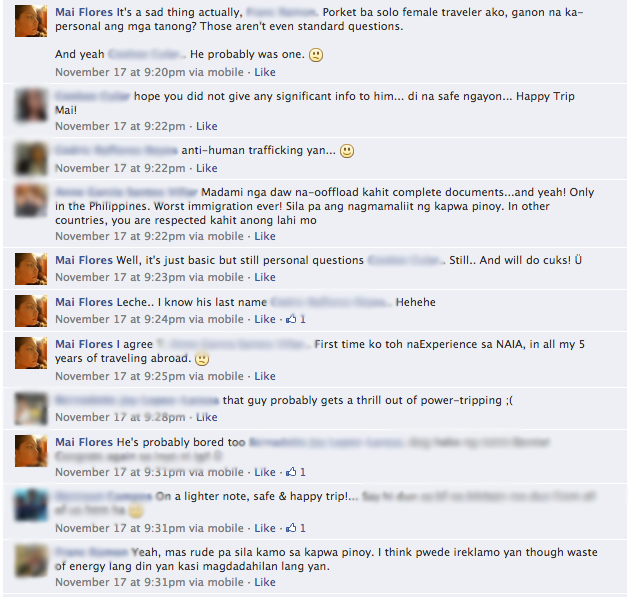 That was rudeness to the highest level, If only you have his surname, patay sa tito ko sa Immigration yang kumag na yan. Sayang lang pagiging Aquino ko. Buti na lang hindi ka hinanapan ng engagement ring. LOl One thing I am sure of, humanga siya sa ngiti mo. Oh wow what a experience. Good thing that did not happen to me when I traveled. My first travel abroad was a red eye. But I was going with a friend and we almost missed our plane because she is coming from a connecting flight which was delayed. Anyway, we went through immigration, officer looked at our documents and let us through like a breeze. Guess, on my next trip I better come prepared with ID's and photos! I'm the type of person who does not keep photos of my loved ones on my phone or bag for fear that if I might lose it they may use those personal information for malicious intent. We had some identity theft case before but that's another story. ??? grabe naman yan.. very personal na ung questions.. in the first place, ano ba mapapala niya pag nalaman niya pa kung sino bf mo, right..?? very irrelevant.. I believe there are reasons the immigration people would question travelers maybe for security purposes. 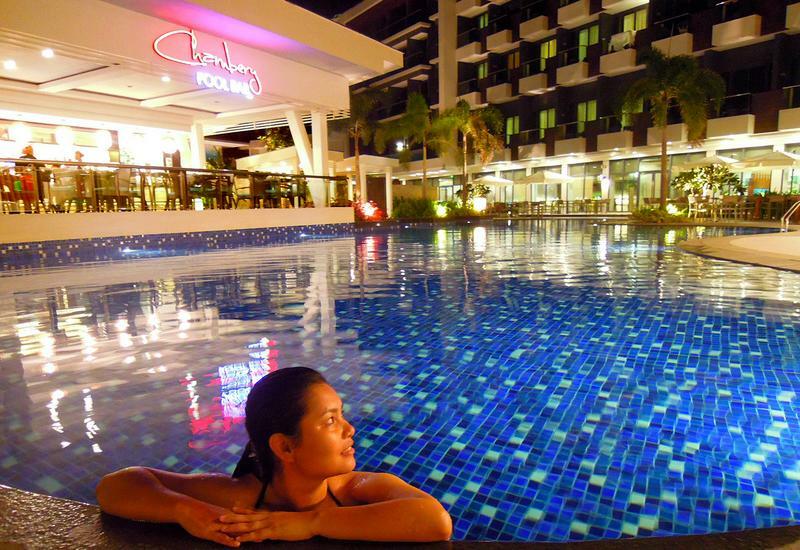 But have you a heard of the story of another blogger when she was questioned in Bali Indonesia? She was suspected as a drug mule. Scary. May crush sa'yo yung immigration officer. I remember this story last year and the questions were really irrelevant. The questions were just too much. Hindi na pang security reasons ang mga tanong. He seems to be implying something. Yun tipong parang kokotongan ka. Goodness. That's really horrible. You should have reported that DOM to his superiors. So far, I've traveled out of the country several times and lucky for me I haven't encountered any officer with this attitude. More so, when I began traveling with my little boy they've become more considerate. I was advised that though these people have become annoying, you just need to remain calm and humble. It's a good thing you knew how to handle such a situation but it is quite unnerving to go through. Now if only it ended with you saying, "So, officer, we done playing 21 questions?" Haha! Sayang, didn't think of that. That would've been a good hirit. I hear you. But I think these incidents were experienced more by single female travelers. Kaya nasalisihan ako. Anyway, I dealt with the situation as calmly as possible since I didn't want my vacation to be ruined. never experienced it too but thanks for the heads up. Actually, I do the same thing rin. Feeling ko mas babae target nila sa ganito, especially mga solo travelers. We all know that profiling isn't all that bad. Pero sana may limitations sa pagtatanong at pagsscrutinize din diba? I hope you and your sister won't have to go through such again! Now I can attest to that! Wow! Identity theft case? That's major! As for me kasi, I like keeping photos on my phone. It has always been that way for me. Good thing, I was able to use it more to my advantage. Why, what happened to you? Did the IO ask you personal questions too? Nakakalungkot naman kung ganon lang ang rason. It had to be at my expense. HAhahaha.. ang puso mo tay! Sadly, I had no time for that..
Hi! Thank you for that clarification. But in my opinion, the way that I was questioned really went overboard talaga. I think I was able to provide plenty of information naman kaso parang 20 questions ang dating --- never-ending. I don't think it was necessary for me to answer all of those questions from the IO, sinagot ko na lang para walang maging poblema sa trip ko. I actually felt my privacy being violated when asked to show a photo of my boyfriend, my work ID, my old passport (which I didn't think was required to be shown kasi expired naman na, buti na lang dala ko). It just gave out a bad impression on my end, being bombarded that way. I mean, I get where you're going with the profiling and all. But I hope that there would be like a limitation din for such an interrogation. Sa Pilipinas ko lang na-experience ang ganong klase ng questioning. I've been traveling in and out of the Philippines for more than 5 years now. Pero ni isang bansang napuntahan ko never ako tinanong that way. Anyway, I appreciate you taking the time to explain the immigration's side of the story (if you do work for them). But I honestly think that there should be a more nicer and lesser intimidating tone when delivering this type of inquest. It fails to empower women at some point kasi. Have a good evening. Fair enough. I get everything naman. Buti na lang I came prepared. I just didn't like how the questioning was done towards my personal life. So I do hope you understand that too, kasi ang panget lang talaga ng feeling on my end. I'm well aware of everything that you're saying. But at the end of the day, I felt violated kahit malinis ang intentions ng IO. Maintindihan niyo rin po sana yung end ko, since I was the one questioned in that manner. Anyway, let's rest this case. Thank you again for making the time to visit my site! Have a nice day! Dude, what you are saying is bullsh*t. If you are really concerned about all that, then you will subject all travelers to the same line of questions, men and women, young and old. Bakit hindi lahat ganun? It's either, namimili kayo o tinatamad kayo. Either way, that makes you INCOMPETENT, ABUSIVE or BOTH. Mahiya kayo sa mga mamamayan na nagpapasweldo sa inyo. I couldn't agree more. Marami ng nakabasa ng post ko at mga response dito, shady for me pa din ang reasons. Sa akin lang din, kung magpprofile ng tama.. sana may manner of respect, yung di mo mararamdaman na navviolate yung privacy mo. Eh nung nagKorea nga ako, tinignan lang ako ng IO sa South Korea at tinanong gaano ako katagal sa bansa. Sinagot ko, then tinatakan na passport ko. Ibang bansa na yun ah --- at take note, may visa pa. I've been to several parts of Asia na, but was never questioned that way. Iba talaga sa dito. Anyhow, sana lang dina mangyari sakin ulit toh since lilipad na naman ako real soon. Yeah, that's what I really felt.. So pano nyo mapapaliwanag to.... Dinala kami dun sa room ng isang BI, napakaraming tinanong, nang halos sigawan na kami. Tapos bigla sya nawala for 30 minutes! Tapos babalik nanaman. Wala namang sasabihin. Tapos mawawala nanaman for 30 minutes.. Kelangan din ba yung lulubog-lilitaw style na yun???? Tapos tinatakan yung passport namin kung kelang naiwan na kami ng flight namin! Hindi kami kriminal para tratuhin nang ganyan! 2 years ago, I was about to go to Hong Kong via Clark with a lady friend on my ticket. Unfortunately, my lady friend cannot go with me because of some personal reasons. But this Lady Immigration Officer, kept asking me about that lady friend. Who is she? Is She related to you? Are you single? Lots of personal questions which has nothing to do with my travel anymore since my friend will not go with me. My papers were all in order and valid and I don't know why our Immigration Officers are so UNPROFESSIONAL in dealing with passengers. Marami pa syang side comments which I found it below the belt and very offensive. Gosh! I feel you on this! Were you able to take that trip, Rico? Yup, but i told the immigration officer that my personal business is none of her business. She told me that it is her business and I insisted that its not her business to intrude on my personal life. I gave her all my documents and its all legal. It took a long time before she stamped my passport. Ganyan din nangyari sa wife ko 2 years ago. Magkikita kami sa Bangkok habang ako ay galing sa Saudi. Ang daming hinanap, ang daming tanong. Buti na lang dala niya marriage certificate namin. Naku! Buti na lang talaga dala niya marriage certificate niyo. That really helped a lot. Although bringing that wasn't required naman. Then again, in unexpected situations like these, it pays to be prepared. Yes, and I still keep on travelling despite those hassles. But never expect a smile from IOs. All over the world, IOs are not smiling, i think its a protocol. why you will be in one room ''?? my friend would not allow to be my sponsor because only relatives in singapore is allowed. i was cried infront of them and just leave. I am very disappointed. is there anything I could do about this? Do let us know how the complaint process and result goes. God bless you!